So, here I sit, on the eve of my June infusion, thinking, reflecting, looking back and forward… What have I realized (or remembered)? I am a feminist (big shock there, I know. I work in IT… go figure) and an activist. I don’t think about things in terms of gender or race or anything else. People are people Everyone should be able to be who they are without anyone else imposing upon them anything that really really really REALLY (get it?) doesn’t matter. I can make a difference. I’ve been doing the theidearoom.net photo a day challenge. I made it every day in may. Then I remembered that I had a blog that was for just such a thing and started posting the pictures here… What’s more, I seem to have been the catalyst for a few other people trying the challenge. And it has been neat to start watching what has been happening. A guy at work who reminds me SO much of my son has started working on June’s list. It’s been great to watch and see where he has taken it. He has added stories to his pictures and I realized that it is really neat to see the story that goes along with pictures. So… I’m going to try that. See how it goes… at least on the blog… maybe not so much on facebook… we’ll see. I’m loving watching what my daughter is posting for her responses to the prompt, too. She’s so much coming into her own as a photographer… following her heart. It is wonderful. My hands hurt. I am “supposed to” have my infusions every 4 weeks. I have been running right about every 5 weeks because it’s how I can get them scheduled. July won’t be any different. I’m kind of bummed because I know that I’m going to be achy when my son is here to visit. On the plus side, I now that Napproxin and Voltaren gel beat back the worst of it for the most part and I have some prednisone if I need to stave it off a little more. Writing… I visited (a couple weeks ago) the farm where I grew up… again… I walked where I walked when I was little. Where the sandbox was… where I used to run and hide to write… where I was told that no one buys poetry and people like me don’t write (and if you write you sure don’t publish if you even admit to it and if you publish YOU will have to pay THEM to publish it) and it’s so cute that I was holding on to childish dreams of writing well into my high school years (oh wait… I’m almost 50 and still holding on). I realized that… for me… writing has never really been about money. I know I will never be on the New York Times Best Seller list. Don’t get me wrong, money is great. And when I get a $50 royalty check it makes me smile. But writing, and especially poetry, isn’t about the money. It is about the music. About the words and the fact that they scream in my head if I don’t let them out. So I write. And I post. And I’m working on pulling them into a poetry book that I will post on amazon and fifty other places and I may charge and I may not. I know that people DO pay for poetry and I know that people do read poetry even if it wasn’t something that people were compelled to do and didn’t enjoy when I was a kid. I do it. I enjoy it and that is really good enough. It’s been a taking stock kind of day. 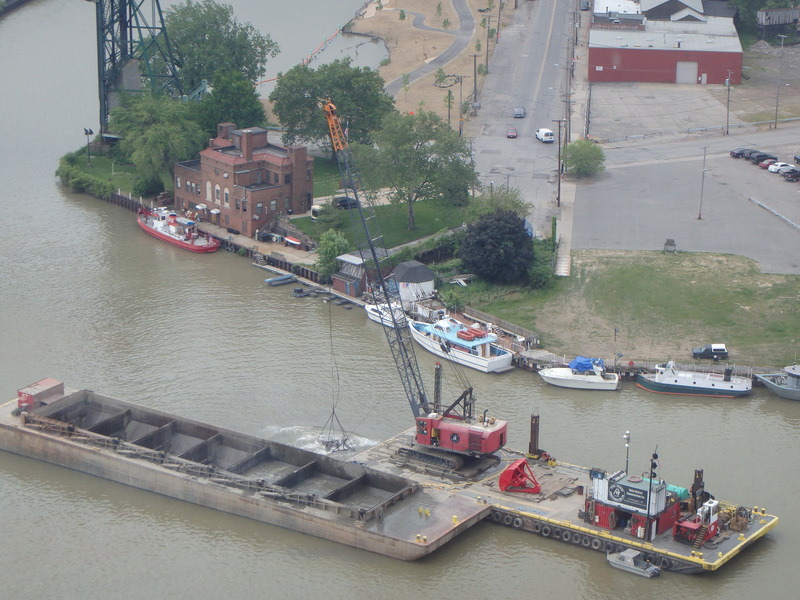 And they are dredging the river right outside where I work, so it’s also entertaining! This entry was posted in rambling, reflection. Bookmark the permalink.